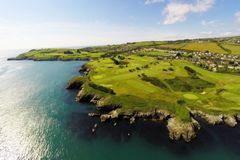 Set between the Irish Sea and the Wicklow Hills, the course at Wicklow Golf Club benefits from a remarkable natural setting, and is a spectacular place to play. The picturesque parkland course tracks the coastline, providing views that are as good as the golf itself. Wicklow is entertaining primarily due to the diversity ofthe challenge; each hole is individual and full of character. There is a finemixture of enjoyable short holes and challenging longer ones, and even if yourgolf lets you down, the unrivalled views will live long in the memory. Not our kind of course. Absolutely every hole slopes away to the sea and it was absolutely pot luck where your ball would end up. I suppose you would get used to where to place your ball if you played it a few times but would not return.